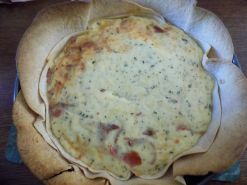 Tortilla Quiche – Create, Make & Bake! This recipe is very handy if you have any leftover tortilla wraps, that or you don’t fancy making pastry. The tortillas make a great, quick and easy case for the quiche, the only downside is that its a pain to cut through. Probably the easiest quiche I’ve done, even if it is just the the fact I didn’t have to do pastry. 1. Get a round pie dish, then start pitting in the tortillas. For the first one you need to place it off centre so the it stick up from the side about 1 inch, do this with the other 3, space them apart evenly. Place the 5th flat in the base. 2. Mix all of the quiche ingredients that are stated, like it said in the recipe, don’t over mix. Pre heat oven to gas mark 4/180*C/350*F.
3. Pour the quiche mixture into the tortilla case, bake for 35-40 minutes, turn it half way through. Don’t worry about how dark the tortillas get, I didn’t and it was fine. Done!